March 2015 n Performance & Hotrod Business n 53 Add-on sales should also be considered. 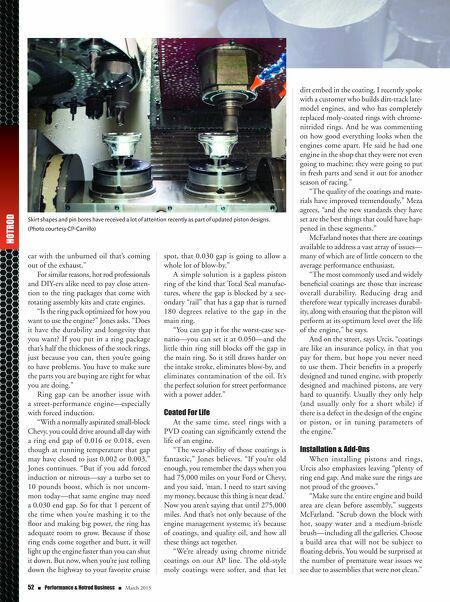 "Every piston needs a wrist pin and rings to go with it," says Urcis. "These should be easy (sales) add-ons." Meza says builders should have enough information about pistons to advise cus- tomers to upgrade pins and rings when necessary, based on the application. "For example, you can't use a standard pin in an engine that will see 30-psi boost." McFarland also suggests "gaskets, seal- ants, bearings, fasteners and specialty tools," as sales packages. Beyond that, "identify the customer's goals up front, and plan for some additional horsepower, torque, and rpm. Seldom is a customer happy with the initial power output for long. 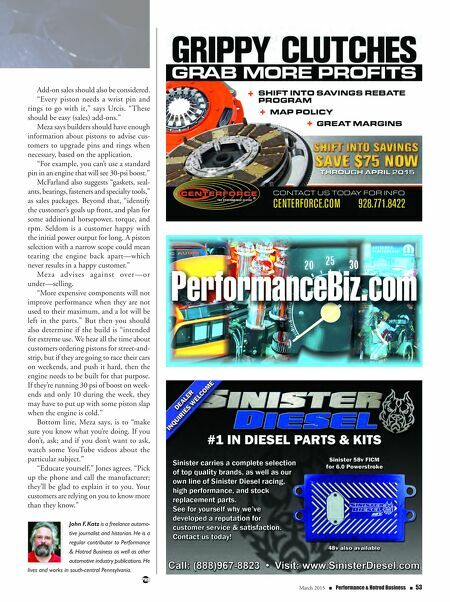 A piston selection with a narrow scope could mean tearing the engine back apart—which never results in a happy customer." Me za advises against over—or under—selling. "More expensive components will not improve performance when they are not used to their maximum, and a lot will be left in the parts." But then you should also determine if the build is "intended for extreme use. We hear all the time about customers ordering pistons for street-and- strip, but if they are going to race their cars on weekends, and push it hard, then the engine needs to be built for that purpose. If they're running 30 psi of boost on week- ends and only 10 during the week, they may have to put up with some piston slap when the engine is cold." Bottom line, Meza says, is to "make sure you know what you're doing. If you don't, ask; and if you don't want to ask, watch some YouTube videos about the particular subject." "Educate yourself," Jones agrees. "Pick up the phone and call the manufacturer; they'll be glad to explain it to you. Your customers are relying on you to know more than they know." John F. Katz is a freelance automo- tive journalist and historian. He is a regular contributor to Performance & Hotrod Business as well as other automotive industry publications. He lives and works in south-central Pennsylvania.